In honour of this week’s release of The Dark Knight Rises, Failed Critics is going quite literally Batshit mental as we devote the site for one week only to the Caped Crusader. Today our very own Gerry McAuley gives us a brief summary of the main influences on Christopher Nolan’s trilogy from the comic book world. So you can seem knowledgeable to your friends on the way in to the cinema, obviously! I’m sure we’re all familiar with Batman – after all, D.C. Comics’ flagship superhero has infiltrated popular culture quite successfully in his 70+ years of life. Film adaptations since 1989 have revived the franchise and put a new spin on a hero who for most people was previously associated with the annoyingly camp and light-hearted original series (and 1966 film) starring Adam West as Bruce Wayne/Bats. What fewer are aware of though is that the darker interpretation which began with Tim Burton’s Batman in 1989 and was continued 16 years later by Christopher Nolan (I prefer to forget the Schumacher films in between) reflects a shift in tone in the comic world too. In 1986, Frank Miller – who would of course go on to write Sin City and 300, both of which became hugely successful films – wrote The Dark Knight Returns, the gritty tale of a jaded 55 year old Batman who was forced to come out of retirement and save Gotham again. The gap between The Dark Knight and the sequel would seem to be based on Miller’s story, as Batman has been chased out of Gotham for eight years after taking responsibility for Harvey Dent’s crimes. Of course, Tom Hardy’s Bane first gained prominence in the Knightfall story arc in the early 90s, so Nolan’s universe is hugely reliant on recent Batman interpretations. 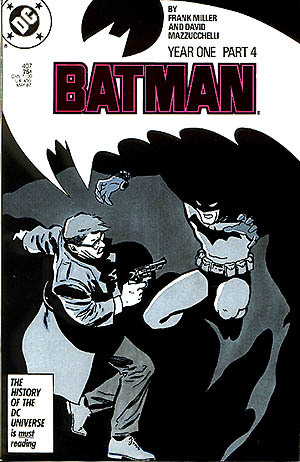 As will be seen later, another Miller title, Batman: Year One, is a major influence on Batman Begins. Ledger’s Joker in The Dark Knight famously provides differing accounts of how he got his scars, which his comic book counterpart does not have – just one example of the different ways the Batman mythology can be interpreted. The strongest influence on Nolan however seems to have been Batman: The Long Halloween, Jeph Loeb and Tim Sale’s 1996-1997 epic. So strong was that influence that Nolan and David Goyer, the co-writer of the trilogy, provided an introduction to the latest edition of the graphic novel. Although taken from an interview in 2006, just before principal photography began on TDK, both men cite the influence Long Halloween had on both movies and surely the third instalment too. And with that, allow me to make some suggestions for those of you who are curious about exploring the Batman legend further. Nolan’s trilogy is so epic in scope that one cannot help be drawn in to that world; given that, it seems appropriate to focus on the more recent interpretations which have that gritty, realistic feel. The place to start is Frank Miller’s Year One, which tells the origin story better than anything else and was recently voted the greatest Batman story ever by IGN. Goyer cites it as one of the three main influences on him in Batman lore and this is clear in Begins. There are various versions of the book around and crucially for those of you who don’t find comics appealing, an animated film of the story was released in 2011 which very faithfully follows Miller’s original. The next stop should be The Long Halloween, which takes place early in Batman’s career and takes in a staggering number of the rogues gallery of villains our hero faces. If Year One is the basis of Begins, this is obviously the foundation of TDK. Harvey Dent’s story will be very familiar and the Nolan interpretation is largely faithful to Loeb’s story. Furthermore, the subtle differences between the two will give a new appreciation of Nolan’s skill – for instance, he plays with the viewer by having a gun pulled on Dent in the courtroom, a threat which Dent confidently disarms; in Long Halloween, this is a much more pivotal moment which I won’t spoil here. Needless to say, familiar Batman fans had a different moment of suspense and surprise with that particular scene. 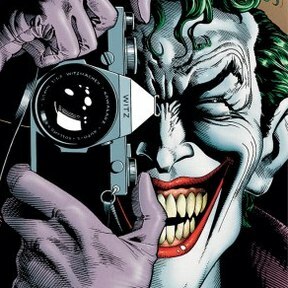 Moving on, The Killing Joke is utterly brilliant and really gets to the heart of how small the differences are between good and evil, exploring how our reactions to difficulties can shape both our lives and the world. Yes, there is much more to Batman than you might think. As an aside, there’s a book called Batman and Philosophy which highlights just how many issues are present in the Dark Knight’s struggles against evil. With a view to The Dark Knight Rises, the main villains could do with a look too. Bane, as mentioned, appears in Gotham in the Knightfall trilogy and Hardy’s version is apparently much more true to the original than the horrible portrayal Schumacher had Robert Swenson give in Batman & Robin. For Catwoman, choices abound and both Long Halloween and Year One feature a certain Selina Kyle. Hush is the most recent title to have an interesting portrait of Bruce and Selina’s complex relationship and is visually stunning. To finish off, of course The Dark Knight Returns is a must. I’ve already spoken about the content and the impact of the story but it bears repeating that this is far, far more than ‘just a comic’ as many tend to dismiss Batman stories – as if comics cannot be a serious medium. Hopefully, reading some of the above will correct that impression and give you the added bonus of really knowing what you’re talking about when watching the films with your mates, rather than just blagging it based on the info I’ve given you. Gerry will be discussing this article as well as a myriad of other Bat-things on this week’s Failed Critics Podcast Batman Special. Previous PostHow ‘unlimited’ could save the cinema experienceNext PostBATMAN WEEK – Holy Adam West!